Neapolitan cake is always made by vanilla, chocolate and strawberry cake, yes this cake goes for three layers of cake with different flavour. Neapolitan cake goes for a long process since it goes for three layers of chocolate,vanilla and strawberry cakes, the best alternative for making this delicious cake is baking them as cupcakes. For our this month's Home Baker's Challenge, a monthly baking event where we bake varieties of baked goodies, the host of this month is Siri of The Brave Cook. She suggested 5 different baked goodies, one among her choice is Neapolitan cake or neapolitan cupcakes. I immediately chosed cupcakes instead of cake as i dont want to spend more time in baking three layers of cakes.Sending Bake Fest#29 event by Vardhini,hosted by me. This cupcakes are eggless, butterfree but not vegan which i simply prepared by preparing a cake batter which i divided into three equal portions. I used strawberry jam for strawberry flavoured batter, cocoa powder for chocolate batter and vanilla extract for the vanilla flavoured batter. 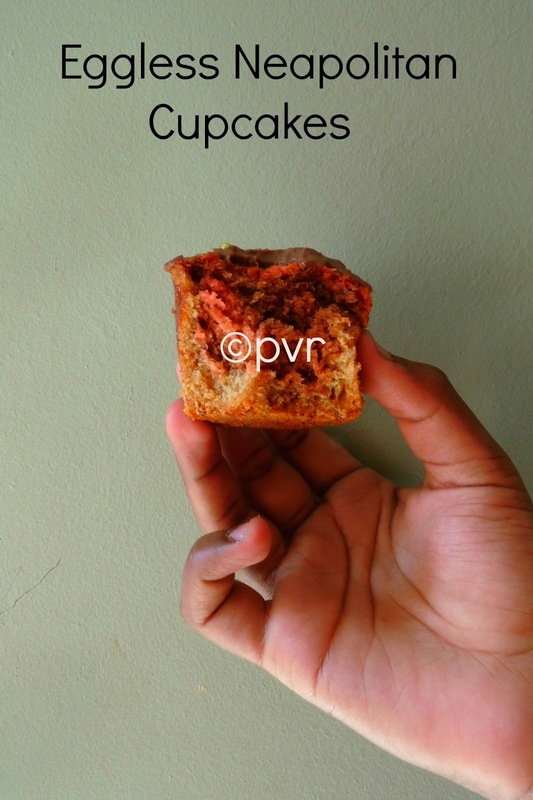 These eggless cupcakes turned out extremely spongy,a prefect evening snacks to enjoy with your favourite drink. Thanks to Siri for pulling me to make this eggless beauties.Am running blogging marathon this week and my theme of this week is chocolates, since this cupcakes suits prefectly for the theme, am posting these cuties today.Check out the Blogging Marathon page for the other Blogging Marathoners doing BM#38 . Boil the milk, add the vinegar, when the milk starts curdle, keep it in simmer for few seconds, put off the stove. Sieve the flour, baking soda, baking powder twice in a bowl. Add the paneer,whey,oil to the dry ingredients and mix well with spatula. Now divide the batter into three equal portions. To one portion, add the vanilla extract, to an another portion add the cocoa powder and to the third one add the strawberry jam. Spoon the vanilla batter to the muffin mould, followed by chocolate batter and then pour the strawberry batter upto 3/4th of the mould. Arrange the moulds in the middle rack and bake for 20-25minutes. Let the cupcakes gets cool completely. Combine all the ingredients in a bowl,beat with a electric mixer until the frosting turns creamy. 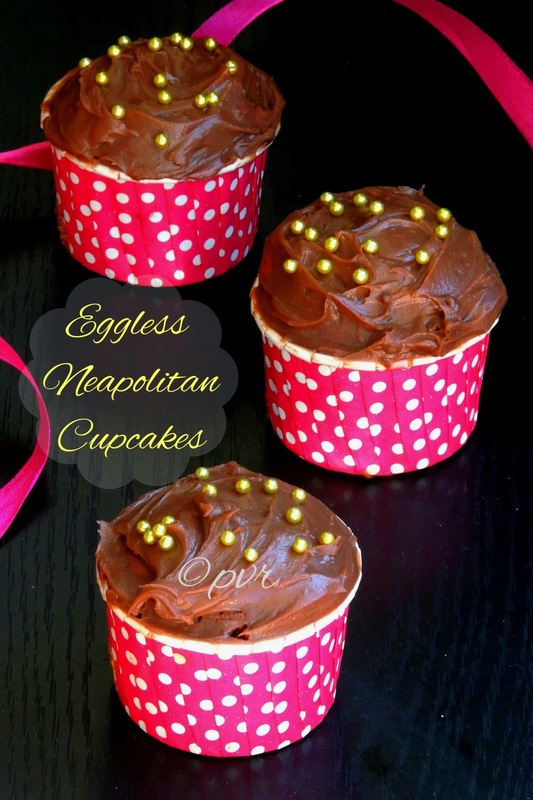 Spoon the buttercream on the top of the cupcakes and decorate with golden sugar pearls. Wow those cupcakes are really looking sinful priya..
just look at those cupcakes... gorgeous!!! interestign little napoleans, Priya !! wow such a cute looking cups.. wish to grab them right away..
Those cute little muffin liners look lovely! Liked the cupcake and also the cute colourful cups. Three flavours are my favourites. So its a sure hit cup cake. Delicious cupcakes!!! They must have been finished in seconds!! Mouthwatering cake. Looks too too good. Kalakkittinga! They are soooo pretty! Makes me really eat one! Cute cup cakes! they look too good to resist. interesting cake with paneer, love it sis!!! This is a real treat..looks absolutely delicious. That cake is absolutely gorgeous. Love all the flavors. Tes cupcakes sont très réussis et doivent être délicieux. Bravo!!! !